:: Feige Filling Technology Asia Pacific Pte. Ltd.
At the beginning of November, an impressive presentation during which innovative system planning options were introduced, was held within the Haver Group. Dr. Reinhold Festge, managing shareholder of Haver & Boecker, awarded Feige the task of working out a concept for continuous system design in the 3D range and to present it to the responsible persons of the Haver Group. Feige counts among the customers of long standing of Autodesk, a well-known supplier of 3D software. Already in 1991, the company decided on the use of Autodesk. After the gradual changeover to 3D in 2002, the company changed to the 2011 version of Autodesk Inventor in 2010 so as to be able to construct systems more effectively. What convinced about this solution was the close integration of different Autodesk solutions such as AutoCAD and Autodesk Showcase. "Visualisation offers a clear advantage, as the system can already be experienced before it is manufactured. In addition, today the better part of products offered by suppliers is available in 3D", reasons Thomas Schnell, CAD-administrator at Feige. Visualisations are very important for sales and marketing at Feige and in the entire Haver Group. As soon as a new contract is received, comparisons are made to establish which already existing construction elements will be re-used. "The pre-visualisation of the 3D model in the Inventor during this process is that accurate and realistic that we can use it as basis for decision-making", emphasise the engineers Duus and Rogge, who sign responsible for the presentation together with Schnell. Now when a query for a system is received, slips of paper with sketches and outlines can become a thing of the past: An outline on a mobile terminal (e.g. a tablet PC or iPad) can be executed neatly without any difficulty and saves a lot of time. If a digital 2D hall plan is additionally made available by the customer, the equipment can be directly designed into the correct environment. In this manner, it was also possible to present the Feige Competence Centre in a 3D photograph. An initial quotation can thus be drawn up quickly and at a high quality. If a customer visit is arranged after the initial quotation, the customer's modification requests can be directly integrated on a mobile terminal with CAD application. The customer perceives the innovative design competence, watches how his hall and his requirements are joined together and thus gains confidence in the design process. If the place of installation is heavily piped or when dealing with an old system with many subsequently built-in components and conversions, it makes sense to initially compile a 3D laser scan. With this scan it is possible to check for possible interference factors already during the tender stage and the digital data thus generated can be used in the further course of system planning. Elaborate on-site measures and tedious drawing work can be dispensed with. What follows then is a detailed second quotation which consolidates all project data. Photo-realistic depictions at realistic sites make the presentation and the understanding of technical specifications easier for the purchaser's side. The customer receives his data on a stick in various file types, is guided through the system design and can use the data for internal discussions. Design, marketing and sales can work in 3D and jointly access the data. This is a decisive factor for our success", said Schnell. Dr. Festge thanked everyone for the impressive presentation and instigated a pilot project. Customers are increasingly demanding solutions for complex systems. During the next few weeks, this software is to be worked with in the framework of a project and with technical support from Oelde. The technical expertise gained during this work is to be beneficial for the entire HAVER Group. Particularly elaborate filling equipment by Feige Filling GmbH was designed together with the company's Dutch agency, the engineering consultants Vermeulen, for the Dutch Vivochem BV and installed by Feige Filling in the middle of 2011. Vivochem forms part of the German BÜFA Group and supplies chemical products in the Benelux region. The contract for the new system was the result of the positive experiences gained by both companies after a Feige pallet filler type 26 had already been supplied to Vivochem in 2009. It provides for the explosion-proof filling of chemicals into drums and IBC. For the new factory building at the XL business park Twente in Almelo, a solution for the space problem that continued to occur due to the large volume of containers to be filled had to be found. 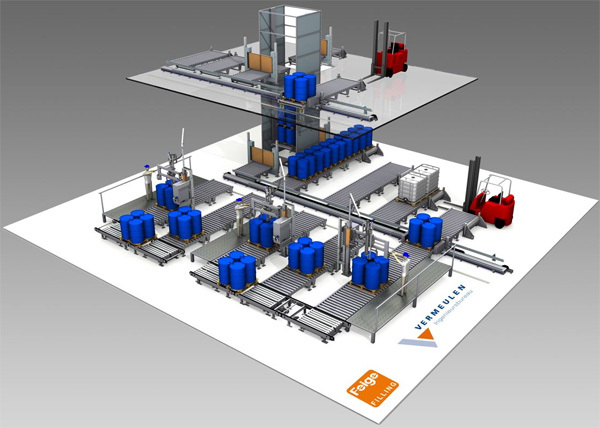 In professional cooperation, Feige, Vermeulen and Vivochem contemplated in detail an innovative logistics for the system to be built. After many discussions and drafts, the perfect solution was found: Based on an idea by Vivochem, the height of the building was integrated in the design. By drawing in an intermediate floor at a low height, a spacious and comfortable storage space for empty containers was created, which did not conspicuously influence the overall investment, but constitutes a logistic gain. In the new system, the pallets with the empty IBC are now automatically transported to the top by means of a pallet conveyor and a lift and are stored there. 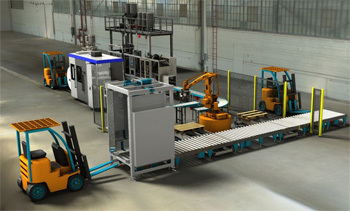 According to the requirements, the forklift operator is asked to make available containers for filling line 1, 2 or 3. These are transported back to the filling level via a pallet shuttle and the vertical conveyor. 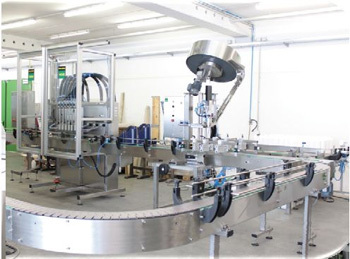 From there, the empty containers are automatically taken to the corresponding fillers and are subsequently in a filled state distributed to the different roller conveyors. These finally transport the full containers with the aid of a fork lift truck into the picking area. 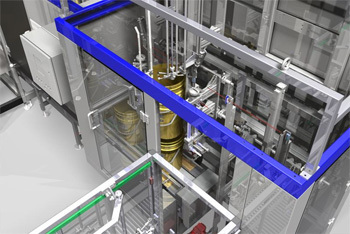 For the new building in Almelo, Vivochem has opted for a filler with separate filling equipment for filling acids, lyes and products, which complies with the ATEX requirements. Every filler has several product lines with corresponding filling valves, so that the product feeds are rinsed and the effects on the environment are reduced to a minimum. The new filler offers short paths to the road tanker. In total, up to 12 road tankers can be filled per day. With the new filler in the Netherlands, Vermeulen and Feige Filling have again demonstrated their high degree of competence in the design and implementation of filling equipment, which is matched to the customer's individual requirements. 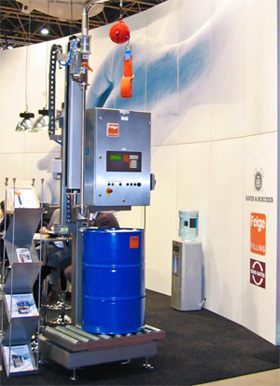 The world-wide market and technology leader Feige Filling offers the complete range of filling technology products for liquid and pasty products in different containers with a volumetric capacity between 1 and 1000 litres. Next year, Feige Filling, which forms part of the Haver & Boecker Group, will be celebrating its 40th company anniversary. For our customers we offer regular training for technical operating and maintenance personnel. Individually adapted to your requirements, certified training can be held at your filler or at our factory. Within the scope of our comprehensive training catalogue, training contents that are tailored to the specific target group are conveyed. A regular update of the required basic and expert knowledge for the operative personnel guarantees a high system efficiency. Making use of state of the art media and training technologies for lasting knowledge transfer, it is possible to book seminars and training courses extending over one or several days. Together with you, we will specify your respective requirements and compile the corresponding training modules. Finally, the successful training will be documented by means of special certificates. We gladly provide you with advice. Our service-center assistant Anja Möller will be at your disposal for further information and individual coordination of your requirements. Machine is designed for filling of 1, 4 and 5 liter bottles of motor oil. Scale electronics with display and keypad "Feige FS-T10k"
The filling station will be delivered on a base frame. Operation can be started with immediately after connecting compressed air, power and product (Plug & Fill).